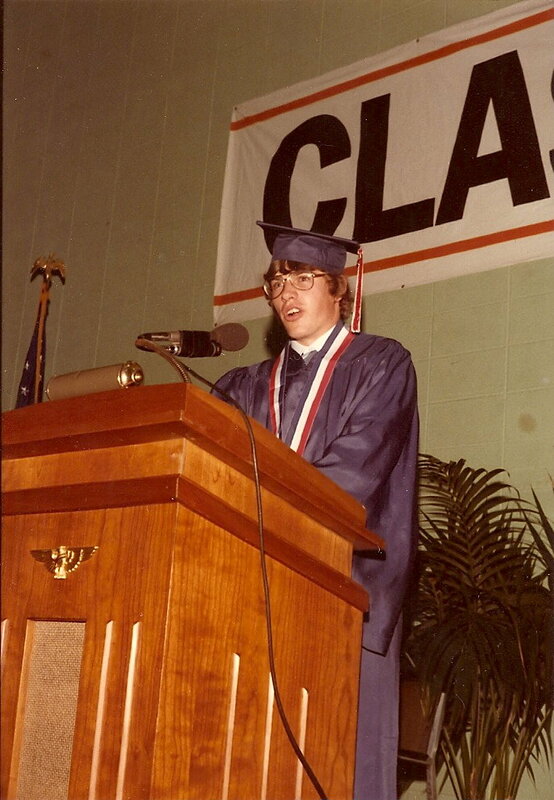 This is a transcription of the Tenafly High School Graduation Commencement address, as written and delivered by Senior Class President Jon-Erik Hexum on Thursday, June 17, 1976. Donated by JP Mullin. 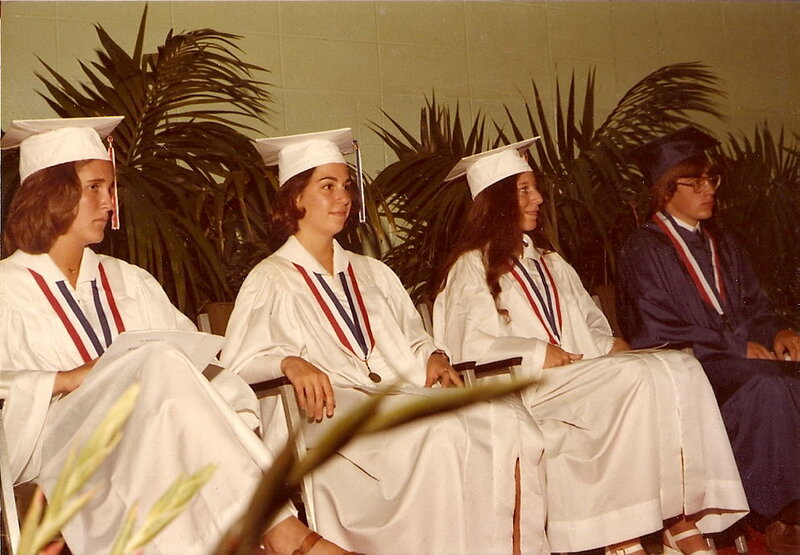 Dr. Geissinger, Dr. Knueppel, Mrs. Berenson, Members of the Board of Education, teachers, parents and friends, good evening and welcome to the Class of 1976 Graduation Ceremony. In addition to being good looking, intelligent, spirited, witty and, of course, modest, our CLASS is unique in a number of ways. FIRST, and most obviously, we are graduating on our country's Bicentennial Year. SECONDLY, we are the first class to complete all four years, Freshman, Sophomore, Junior, Senior, in the new high school. THIRD, This is the first time the students that have gone through public school have ever graduated. And finally, a subject which will be elaborated upon further, later on in the program, we are honored to have our entrance to the world all the way through to our graduation from high school coincide with the career of our retiring Superintendent of Schools, Dr. John B. Geissinger. These special characteristics of our Class, coupled with the unifying forces of our numerous senior activities, make this graduation an especially memorable occasion. I'd like to mention and ask you to remember, for a moment, if you can, two of our classmates who are not able to graduate with us this evening. Karen Cimaluca who died in our Freshman year and Eric Rieser who died just last Spring. Remember them not that you will be futilely saddened but rather that you will gain a greater appreciation of your own life on earth. When we entered the high school, we had a reputation of being the rowdiest bunch of juvenile delinquents ever to occupy a Tenafly classroom. A description of our evil tendencies was even published in a local newspaper. School spirit and Class unity were not yet incorporated into our vocabulary at that time and our goal in school was to see how much time we could waste during fire drills. Well, that was four years ago, and although we still waste time during fire drills, through the years and especially our Senior Year, we've worked together, had a lot of fun, made some good friends, and have become much closer as a class. Some of the activities that helped us to become more unified were the very successful magazine sale, Magazine Assembly with the very lovely Ms. Magazine, the kick-off dance in September, Valentines dance in February, other dances and especially the Halloween Dance on October 32nd. Painting our T-76 on the Field House roof, Senior Gyp Day, the Prom, the Lack of Talent Show, and so many other events that brought us together to plan and to participate in during the year. It is often said that it is not who is best, but rather who has improved the most. 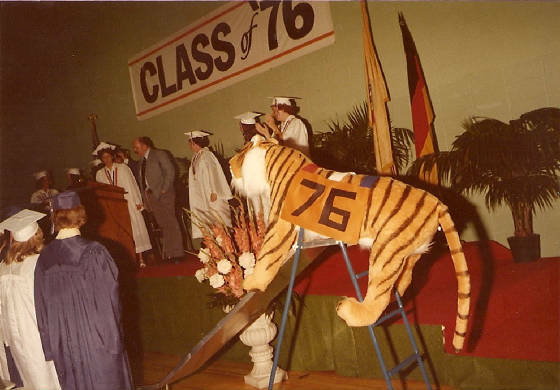 There may have been a more unified or spirited class some time in past history, but few have started out so low and ended up so high in the areas of Class Unity and Spirit as the Tenafly High School Senior Class of 1976. Our guest speaker this evening is well known in Tenafly, as well as in the State of New Jersey and has lectured during a Tenafly Teachers Professional work session and for Tenafly's Bicentennial Fair. A noted author, historian, and head of the New Jersey Historical Commission, Dr. John Cunningham. Each year various school and community organizations present certain graduating Seniors with awards and scholarships. Presenting the Awards for 1976, or Superintendent of Schools, Dr. John B. Geissinger. Would the three Senior Class representatives please approach the Dias. In recognition of Dr. Geissinger's many years of service, Senior Class Representatives Nora Fisher, Patty Teagno and Renee Morana would like to present him with a token of our appreciation and admiration. We have three student speakers this evening, and though their speeches are rather brief, what they have to say is meaningful and well worth our attention. Speaking on the Freedom of Choice, Nancy Marder. We have attempted to leave with the High School something that is useful, as well as to spark memories of our Class. Presenting the Gift of the Class of 1976, an extremely hard working and dependable graduation Chairperson, Kathy Trainor. Our next speaker is a veteran of Echo, the school newspaper, and she has helped us out a good deal this year. She has also been an accompanist for the Solitan Social Club Ballet. Speaking about "A Place in the World", Laura Molnar. Our next speaker is a real spirited, enthusiastic Tenafly Type Tiger, an ardent supporter of Tenafly High School sports and longtime member of the Cheerleading Squad, speaking tonight on the Citizens of Democracy, Nancy Bree. We have had a very successful Senior Year in many ways due largely to the guidance of our Senior Class Advisor, Mr. John P. Mullin. Formally expressing the Class' appreciation, is this year's Treasurer, Peggy Silberthau. When we were Freshmen we had to adjust to a lot of new things: a new school building, a new innovation called I D T, and a new Principal, Dr. DANIEL KNUEPPEL. and low ticket sales in the DEN. don't seem all that bad. life here doesn't seem all that sullen. their context may be hard to recall. We certainly did have a ball. people we love in fair and strong weather. we have made by and by. All of which we were a part. Before it is time to depart. Remember the good times -- learn from the bad. years that we'll never forget & we have reached the end at last. Remember me, I won't forget you..
Before we adjourn this evening, I would like to extend an invitation to all parents and graduates to the Board of Education Reception in the parking lot immediately following the graduation ceremony. Following my closing remarks, Mr. Pickett will sing the school Alma Mater, at which time you are requested to rise. I should like to extend my sincere appreciation and thanks to all the Seniors who have worked to improve overall unity and spirit, not only within the Senior Class, but within the entire school. I would also like to publicly extend my personal thanks to J. P. Mullin. He's a good guy. It's difficult to say what we will all be. Some of us will be doctors, lawyers, accountants. Some of us will be rich and others, famous. Hopefully, all of us will be happy.